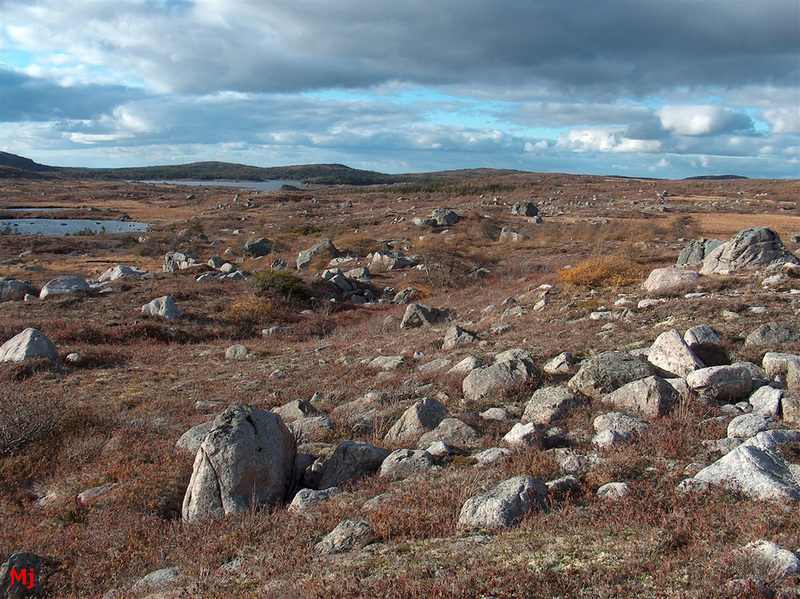 The landscape pictured above is a bedrock landscape, overlain by a thin layer of tundra and glacial till. The streamlined landforms record the movement of warm-based glacial ice at or near the end of the Wisconsin glacial stage. No part of Heart of Avalonia escaped the impact of the multi-hundred metre thick ice sheets that covered the entire region for the 110 thousand year interval preceding the current warm period. 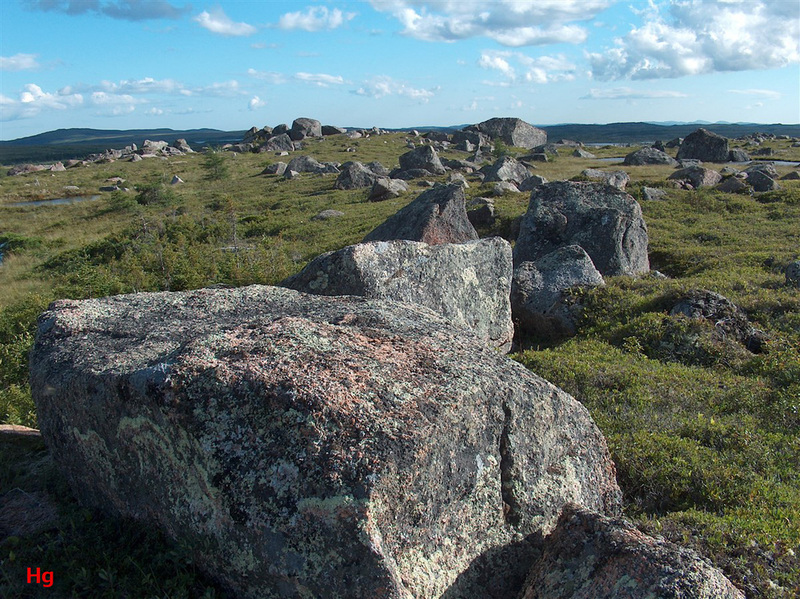 A multitude of glacial erratics are shown in the photo above. In most cases in Heart of Avalonia, glacial erratics are not really erratic, but rather tend to closely represent local bedrock. This indicates that the distances the rocks were transported by ice were short. 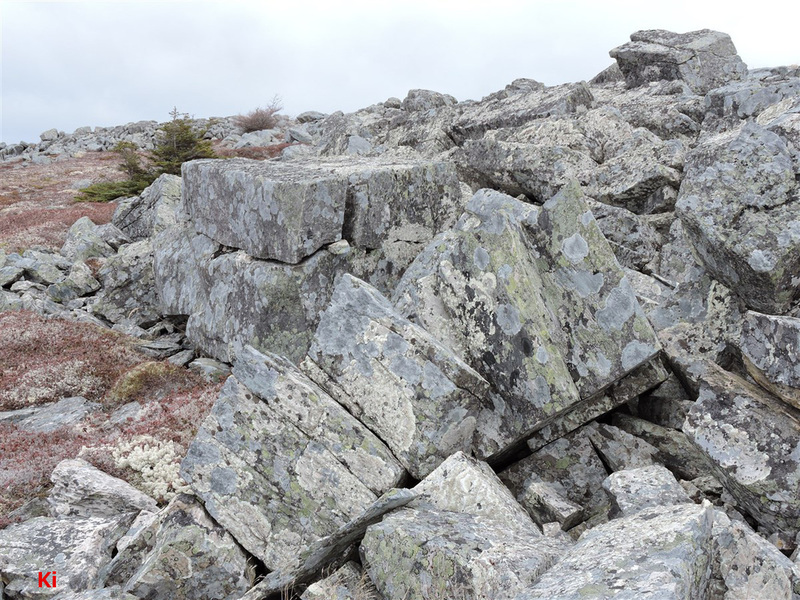 Most of the boulders shown above are granite, and they overlie a granite pluton. It is not surprising that glacial transport distances in the region are commonly short since the distance a glacier must flow to reach the sea is at most a few kilometres or tens of kilometres. 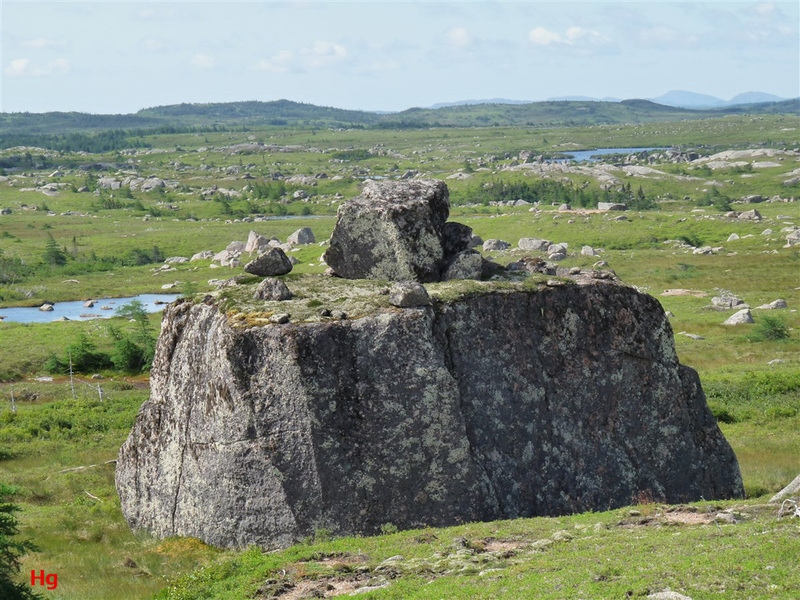 In spite of the relatively short transport distances, the presence of erratics is a good indicator of past glacial flow over an area, especially when the area is covered with water or vegetation and bedrock is not visible. Larger erratics are shown above. 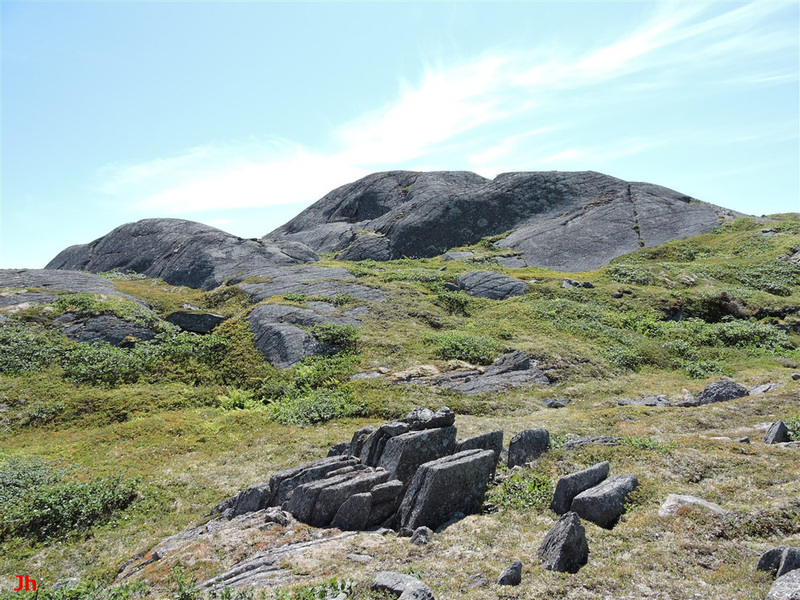 These were deposited by ice flowing from the main ice sheet covering the central portion of the Island of Newfoundland. The photo below shows one of the largest glacial erratics (height ~5 m) seen in the Heart of Avalonia field observations to date. 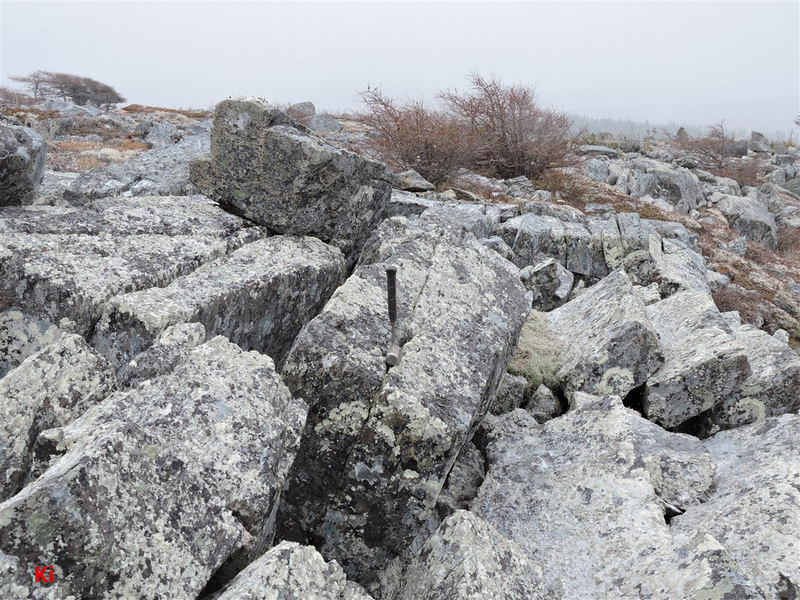 The main granite block, looking like a bedrock outcrop with erratics on top of it, was revealed to have been glacially transported after inspecting the ground beneath it and noting that the base of the block was not in conformity with the underlying rock. 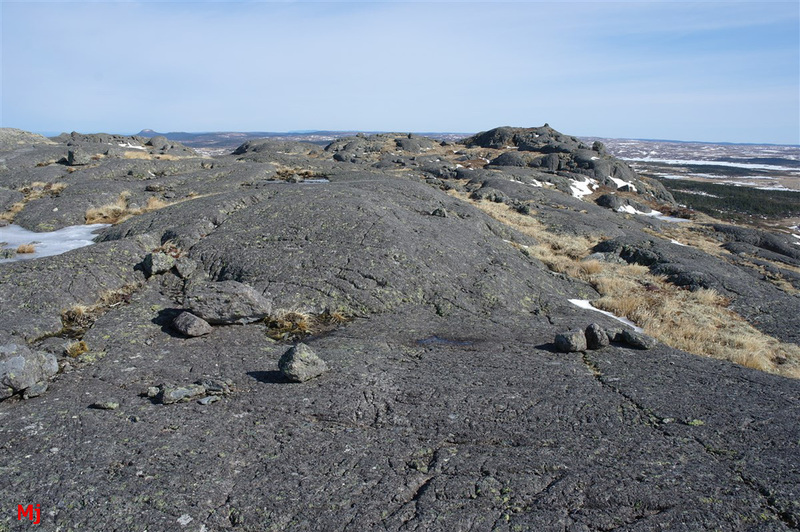 Erratics are often formed by plucking, or more generally, they are produced when glacial activity places bedrock in tension. 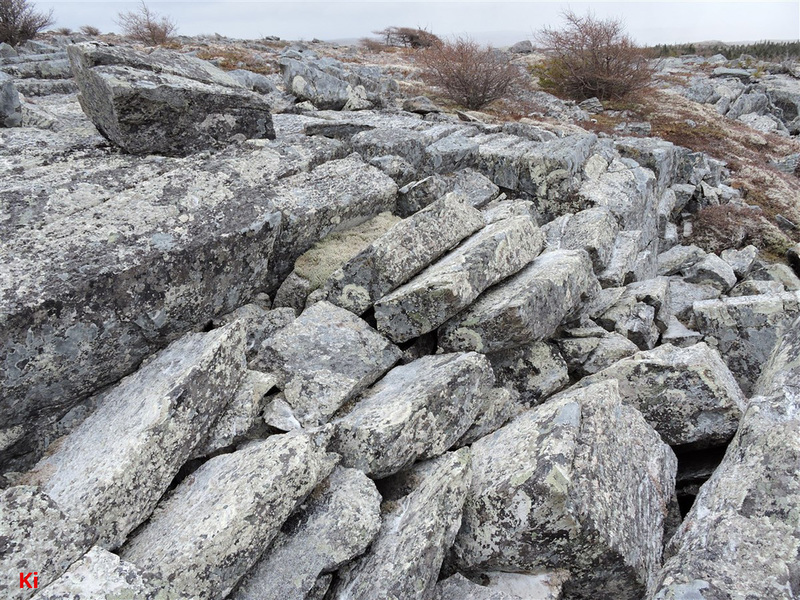 Erratics and till can also be produced when sections of bedrock are sheared off by ice-induced stress, as illustrated in the photo below. 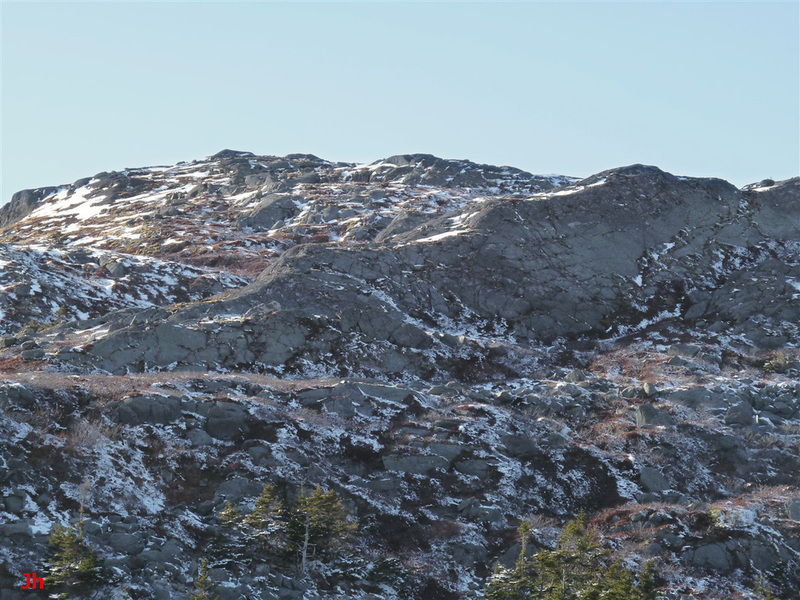 The picture shows a large section of bedrock on the side of a hill where ice has apparently moved over the rock in the direction upper right to lower left as seen in the photo. 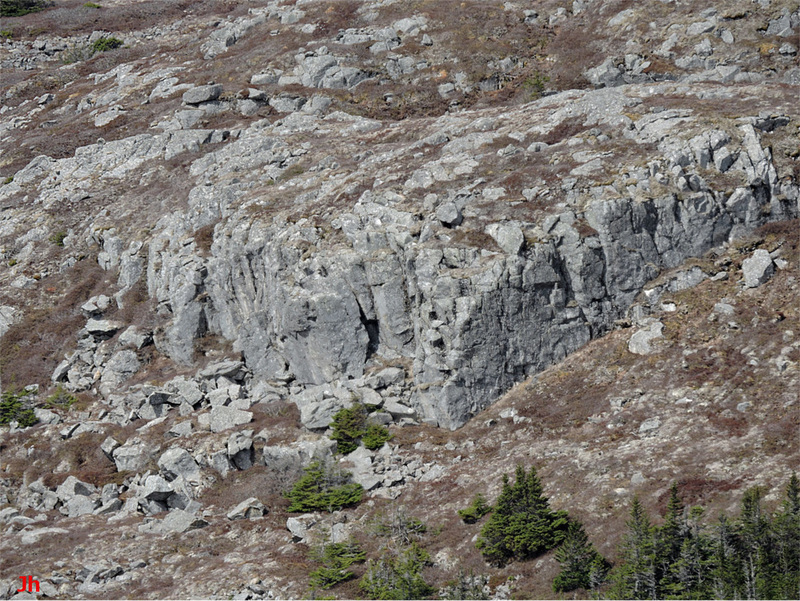 The bedrock has been plucked on the down-ice end (left on photo), while rock on the side of the outcrop has been sheared away (right on photo), leaving a cliff. This cliff follows tectonic cross jointing. The debris remaining from the shearing-off of the bedrock was transported down-ice by the glacier and is not visible in the photo. Most inland cliffs in Heart of Avalonia are formed by processes similar to the glacial erosion depicted in the photo. The following three photos show areas strongly eroded by basal slip glacial ice motion, characteristic of an environment where the ice-rock interface was at the pressure melting point. Such warm-based glacial activity could theoretically result from deep ice cover, where the geothermal gradient warms the base of an ice sheet to the melting point. More likely though, the entire glacier was temperate when the erosion took place, the temperate ice conditions reflecting the warming climate taking hold near the end of the Wisconsin glacial stage. Determinations of ice flow direction at points on the Avalon Peninsula suggest that before the Laurentide ice sheet or the central Newfoundland ice sheet reached the Avalon, independent centers of glaciation developed and, from these, ice spread over the entire peninsula (see map in Regional Paleoclimate). Four potential ice centers have been identified by researchers, three over land and one offshore. The three land-based ice centers could theoretically influence the type of bedrock erosion found in their specific areas. The existence of an ice center implies a core central region where local horizontal ice flow is diminished, thus locally reducing basal slip erosion and the transport of erratics. 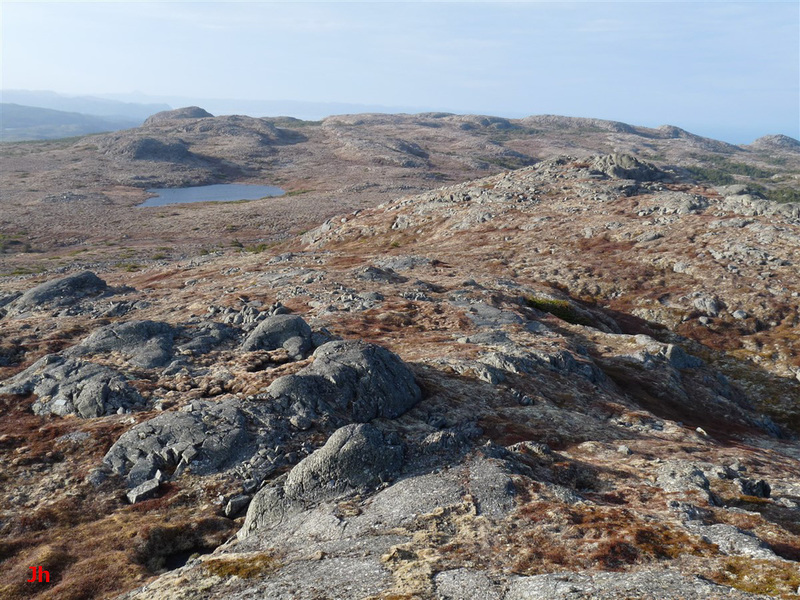 Local reduction in horizontal ice flow would be of little long term consequence if, following formation of an independent ice cap, the ice cap was completely overrun and displaced by the larger and thicker ice sheet encroaching from the main body of the Island of Newfoundland. However, if during deglaciation a local ice cap remained established as a stationary ice mass, then the downwasting of this ice mass could create a tensile erosion environment in the underlying bedrock. This is illustrated in the following diagram. In an area where bedrock was subjected to tensile stress by a descending and diverging ice stream, initial smoothing by basal slip erosion could be overprinted by tensile erosion features such as fissures and plucking, particularly along the edges of small hills and ridges. In the present context, the above diagram relates to larger, regional-scale ice centers. However, the same diagram could also apply to a multitude of smaller, highly localized patches of remnant ice such as might appear in the final stages of deglaciation of a rugged but low-relief topography. It is difficult to determine whether the glaciers that existed over Heart of Avalonia during the major portion of the Wisconsin stage, and in particular near the last glacial maximum, were warm-based or cold-based. Present day polar glaciers in Antarctica and Greenland are cold-based except in areas where the ice is extremely thick (some parts of Antarctica) or there is an underlying geothermal "hot spot" (north-central Greenland). The climatic conditions in Newfoundland during the middle Wisconsin period would certainly be warmer than the present-day interiors of Greenland and Antarctica because of Newfoundland's non-polar latitude and the region's proximity to the Atlantic ocean. Conditions could still be quite cold, though, and the ice cover was considerably thinner than polar ice caps thereby increasing heat loss from bedrock to the external environment. 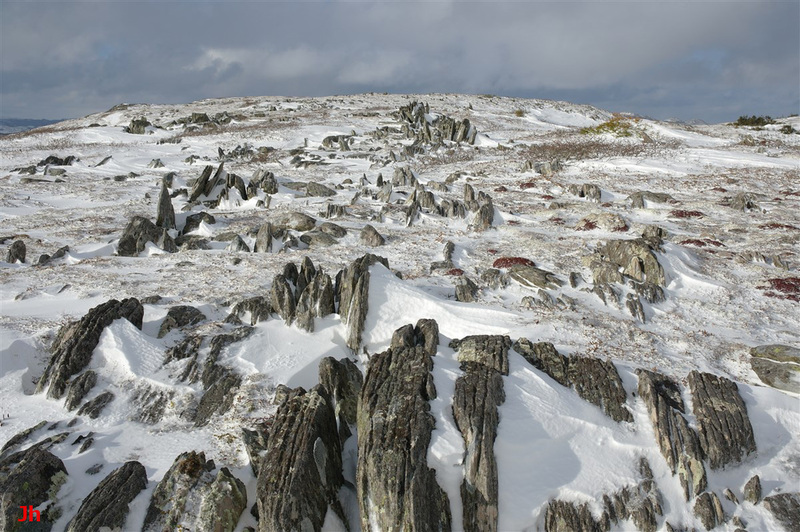 If conditions were cold enough to engender cold-based glaciation, little or no record of this low-erosion period would likely survive the warm-based glacial activity that eventually became prevalent. Further ambiguity results from the possible re-establishment of cold-based glacial conditions or periglacial conditions during the Younger Dryas. Such late-stage return to near-polar climate conditions, this time with reduced ice cover or no protective ice cover in some areas, would allow development of severe and dominant ice-creep or frost-wedge bedrock erosion features, masking any evidence of earlier cold-based glaciation. The photo below hints at a transition from warm-based glaciation to either cold based glaciation with little ice motion, or else to periglacial conditions with glacial ice absent. 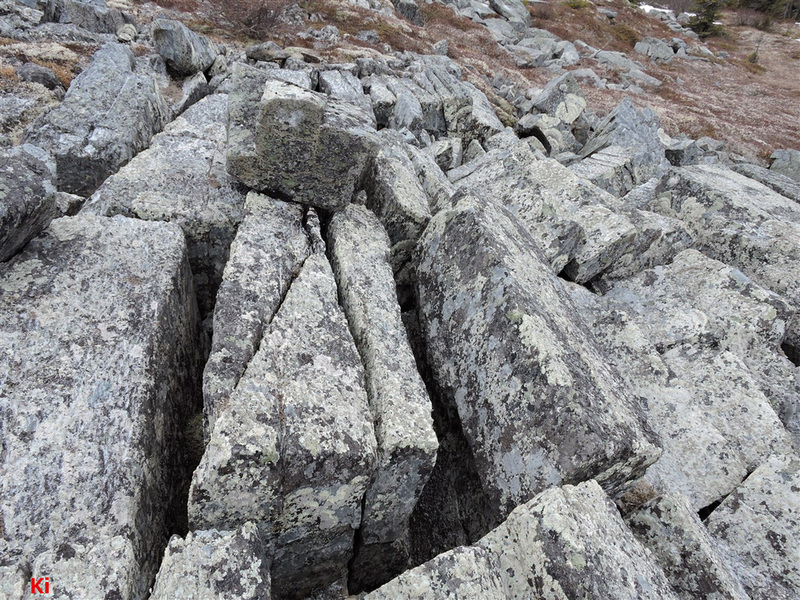 The frost-heaved joint blocks seen in the foreground were uplifted from a glacially contoured bedrock substrate closely resembling that appearing in the background. The frost-heave event evidently occurred after the basal-slip erosion event that originally contoured the bedrock. The area shown in the photo is elevated (ridge top), well drained and above the present-day water table. Permafrost would be needed to confine meltwater beneath the frost-heaved blocks. The following photo illustrates an area underlain by sedimentary bedrock with a strong tectonically-induced foliation, dipping vertically. 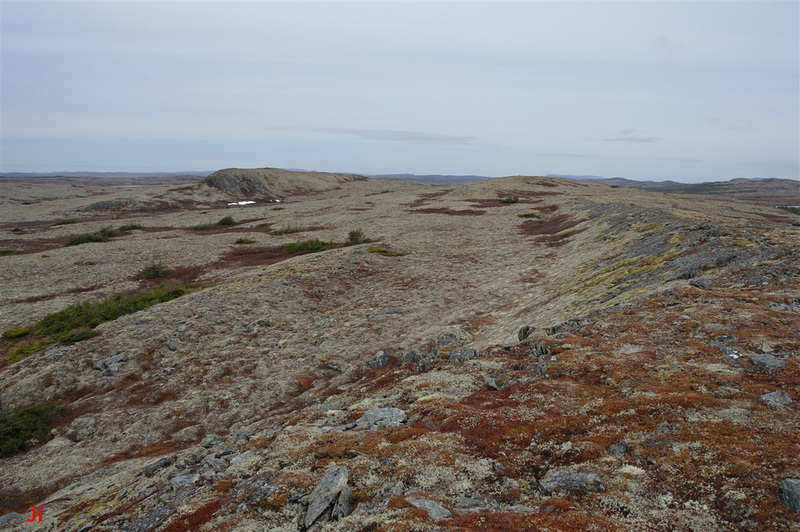 Thin tundra covers the bedrock that has not been uplifted by frost-heave. Nearby landforms provide evidence of intense basal-slip glacial erosion that predated the formation of the fragile frost-heave features appearing in the photo. As with the previous photo, this picture suggests a transition from a warm-based glacial erosion environment to post-glacial permafrost conditions. The views above show bedrock, initially smoothed by warm-based glacial erosion, then shattered by large scale ice-creep erosion and/or frost heave. This type of rock disruption seems indicative of a high-thermal gradient environment and points to a radical change in climate and erosion conditions following a preceding episode of warm-based glaciation. A key question arises as to why large areas of bedrock can retain non-disrupted evidence of basal-slip smoothing, while other areas (for example, photos directly above in this section, and Polar Desert) were smoothed, then shattered. Climate would be expected to vary only slightly over the Heart of Avalonia area because of the relatively small geographic extent of the region and the generally low-elevation topography. Differences in bedrock geology and jointing could account for differences in frost-disruption response, but zones of highly disrupted bedrock and unbroken bedrock extend across a variety of similar and dissimilar rock types. Erosion of bedrock placed in tension as discussed above (Ice centers) might account for some observations of plucking, fissures or non-frost-heave bedrock disruption. However, tensile stress would not account for bedrock pushed vertically upward from a horizontal surface (most frost-heaved bedrock). As well, erosion features showing evidence of frost-wedge or frost-heave action would not be expected to form under more than three or four metres of ice cover. This leaves 1) presence or absence of protective ice cover, 2) potential loading via creep of cold-based glacial ice and 3) groundwater availability and pressure as key parameters likely to determine whether bedrock was either frost-disrupted or else left intact at a particular location.